Plants picked up to 150 years ago by Victorian collectors and held by the million in herbarium collections across the world could become a powerful - and much needed - new source of data for studying climate change, according to research led by the University of East Anglia and published in the British Ecological Society's Journal of Ecology. The scarcity of reliable long-term data on phenology – the study of natural climate-driven events such as the timing of trees coming into leaf or plants flowering each spring – has hindered scientists' understanding of how species respond to climate change. But new research by a team of ecologists from UEA, the University of Kent, the University of Sussex and the Royal Botanic Gardens, Kew shows that plants pressed up to 150 years ago tell the same story about warmer springs resulting in earlier flowering as field-based observations of flowering made much more recently. 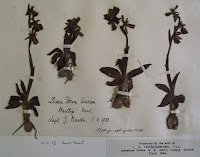 The team examined 77 specimens of the early spider orchid (Ophrys sphegodes) collected between 1848 and 1958 and held at the Royal Botanic Gardens, Kew and the Natural History Museum in London. Because each specimen contains details of when and where it was picked, the researchers were able to match this with Meteorological Office records to examine how mean spring temperatures affected the orchids' flowering. They then compared these data with field observations of peak flowering of the same orchid species in the Castle Hill National Nature Reserve, East Sussex from 1975 to 2006, and found that the response of flowering time to temperature was identical both in herbarium specimens and field data. In both the pressed plants and the field observations, the orchid flowered 6 days earlier for every 1oC rise in mean spring temperature. The results are first direct proof that pressed plants in herbarium collections can be used to study relationships between phenology and climate change when field-based data are not available, as is almost always the case. According to the study's lead author Karen Robbirt, a PhD student in UEA’s School of Biological Sciences: “The results of our study are exciting because the flowering response to spring temperature was so strikingly close in the two independent sources of data. This suggests that pressed plant collections may provide valuable additional information for climate-change studies. The study opens up important new uses for the 2.5 billion plant and animal specimens held in natural history collections in museums and herbaria. Some specimens date back to the time of Linnaeus (who devised our system of naming plants and animals) 250 years ago. Phenology – or the timing of natural events – is an important means of studying the impact of climate change on plants and animals. “Recent climate change has undoubtedly affected the timing of development and seasonal events in many groups of organisms. Understanding the effects of recent climate change is a vital step towards predicting the consequences of future change. But only by elucidating the responses of individual species will we be able to predict the potentially disruptive effects of accelerating climate change on species interactions,” said Prof Davy. Detecting phenological trends in relation to long-term climate change is not straightforward and relies on scarce long-term studies. “We need information collected over a long period to enable us confidently to identify trends that could be due to climate change. Unfortunately most field studies are relatively brief, so there are very few long-term field data available,” explained Prof Davy.